CSRA celebrated its tenth year in business last month, so it was a great opportunity to reflect on where we’ve been and where we’re going as well as on how the market has changed and what makes our approach distinctive. Since 2006, I’ve seen social media’s role morph from oddball disruptor to the largest line item in marketing spend at many firms. Today, an increasing portion of firms attribute most of their incoming leads to social media. In 2016, it is a multi-billion dollar industry, so the matter of differentiation is high priority. Right from the beginning, I kept CSRA’s approach to digital social technology focused on building trust and forging relationships, but I’ve been in a very small minority for many years. Today, organizations of all types are starting to recognize that low trust costs them big money. They have high customer acquisition costs, high churn, low customer lifetime value, high recruiting costs… the list is endless. I hacked my own version of ethnographic research and it has become the core of the research phase of experiential social media. I did it because I consistently saw that business is built on trust and relationships. Trust is built by having meaningful interactions. Meaningful interactions are built on caring and being relevant. 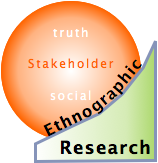 Ethnographic research is the fast lane to understanding people within the context of their communities. When you understand people within their social context, you can show them how relevant you are and how much you care. Caring and relevance builds trust at scale. As its name suggests, ethnographic research is a derivative of ethnography, a discipline in which ethnographers implant themselves within communities in order to conduct methodical, comprehensive observation of people’s cultures, behaviors and desires. The modern incarnation of ethnography dates to the mid-20th century and was chiefly practiced by anthropologists. This definition is significant: implanting oneself within a community and deeply observing behavior. Think about it: the more you understand behavior, the better you can relate to people because you understand individuals within their social context. Since humans and primates are profoundly social, you can best understand an individual within a relevant group. Ethnography is currently being confronted by digitization since the latter is transforming certain aspects of community. For example, one of traditional ethnography’s key definitions of community is that it is a geographical place, but this is changing. Having researched hundreds of digital communities, I, and many other ethnographers who study social media interactions and communities, think it’s defensible to remove the physical geographical constraint. I call CSRA’s practice “ethnographic research” to remove unnecessary friction with traditional ethnographers who often study geographically defined communities for years. To define community, I find it useful to think primarily in terms of relatedness rather than geographical place. I’ve developed numerous metrics to measure relatedness quantitatively, and this enables my teams to be flexible because some communities are strong in some metrics while others rate high in others. The higher the relatedness in a community (overall score), the more defined it is, and the more valuable it is as a place in which to interact and build trust and relationships. For example, forums are often relatively self-contained, and they feature long deep threads along with minimal interactions with external places/sites. In other situations people co-communicate across numerous platforms simultaneously. CSRA serves commercial, nonprofit, and government firms. Although their motivations and goals vary widely, they have in common that certain niches of people (stakeholders) have special impact on our clients’ ability to accomplish their missions. CSRA uses ethnographic research as the first step in relating to these stakeholders in unusually supportive ways, which builds trust. Increasing trust between our clients and their stakeholders makes attaining their missions faster, more efficient, and less risky. Even more interesting, when we develop trust by interacting in digital public, trust-building is immensely scalable because interactions create network and annuity effects. When we develop trust by interacting in digital public, trust-building is immensely scalable because interactions create network and annuity effects. Building trust is relevant to all four use cases: it’s how experiential social media can consistently transform customer and employee relationships and profit by activating the Trust Business Chain Reaction. Trust makes product management, business innovation, social media and cross-border business far less risky and more successful. To understand why, think in terms of interactions. When people trust you, they are more invested in interacting with you (or your product or process); they’re more patient, they listen more, and they try harder because you have an emotional connection with them. This is easy to see in social media because it’s an explicit interaction, but it’s also true for products because they “interact” with their users and/or allow their users to interact with/use them. Most products fail because they are too hard to use or not distinctive enough. Now imagine that when users trust your brand, they want to use your product. They are more likely to learn how to use it and to give you helpful feedback instead of just jumping to a competitor. The same thing is true in business innovation and cross-border business, both of which have barriers to be surmounted before participants can reap their rewards. Trust is the engine of competitiveness. As shown in this graphic, interaction, not words, is the lifeblood of trust building. Interactions happen among people in social media, and between users and providers in the context of a product (firm or brand). All these interactions and touches, when done with care and consistency, progress from relevance and care to trust, deepening relationship, and increasing business (or other mission/goal). In CSRA’s case, our interactions (and products and innovations) aim to support people in distinctive ways to build trust, so we need to understand their behavior and motivations as a starting point. Ethnographic research is how we accomplish this. To understand stakeholders, we identify their outcomes when our client is most relevant. Ethnographic research of thousands of social media interactions is ideal because when stakeholders are discussing and helping each other in digital public, we understand individuals within the context of the groups and cultures they create. Unlike traditional market research, we analyze many-to-many interactions, and this accelerates the speed, depth, and breadth of our learning. The point is that my teams immerse themselves in stakeholders’ digital social interactions in a structured way. We discover their true behavior and motivations, and our sample sizes are many times larger than most traditional market research, which relies on self-reporting methods like surveys, interviews, and focus groups. Ethnographic and traditional market research are immensely complementary. In separate posts, I’ll show how to conduct ethnographic research of social media for each use case (links below when available). CSRA teams immerse themselves in digital social interactions and observe in a structured way. We discover stakeholders’ true behavior and motivations. Ethnographic research of social media use cases: Product management, experiential social media, business innovation and cross-border business. Select social media ethnography references. How trust monetizes infographic and summary.